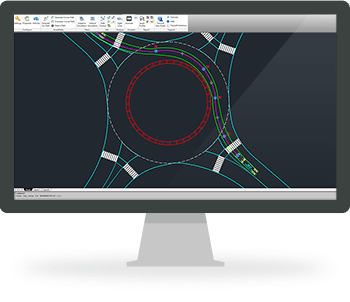 AutoTURN Pro now with IntelliPath - The most advanced vehicle swept path analysis software just got smarter. Transoft Solutions develops state-of-the-art technologies for AEC design professionals. Whether you are designing a new road or highway corridor, mixed-use facility, intersection, site plan, or retro-fitting an existing parking lot, our software can help you complete it confidently and efficiently. The new version of AutoTURN 10 includes two core innovations that mark the beginning of a new chapter in AutoTURN’s evolution – the era of Swept Path 2.0. Watch the recorded launch presentation to see all the new features in action! Transoft Solutions announced that it has acquired the intellectual property rights to ARCport from Aviation Research Corporation (U.S.). A maior seleção de soluções avançadas em trajetória de raio de giro para atender as necessidades de seu projeto. Fácil de usar, software de fluxo de trabalho aprimorado para projetos desafiantes da engenharia. Soluções de software sob medida para projetistas de aeroportos, engenheiros, arquitetos e operadores.